“You should consider yourself lucky,” was the response of one of the white producers of my radio show “Listener’s Action on Homelessness and Housing” for New York radio station WBAI 99.5 FM in late 1987. We were at a cocktail party celebrating the show, when I noticed that I was the ONLY African America present and said, casually to one of the white male producers of the show, “Have you noticed that I am the only Black person here.” To say his reply threw me is a gross understatement. It infuriated me. 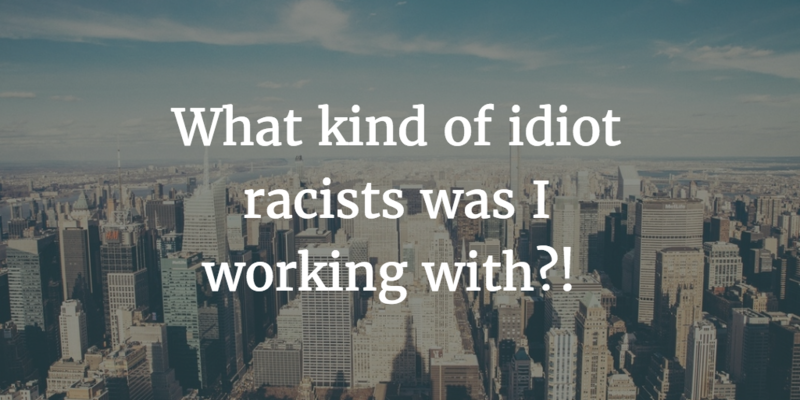 What kind of idiot racists was I working with?! When they offered me the job of producer and host they presented themselves as these cool, hip, socialist bent white “brothers”. The rude awaking of Muhammad Ali’s truth years before that white folk can’t be my brother slapped me across the face and shook the snot out of my spirit. Those white who may argue otherwise never accept the challenge of relinquishing and renouncing the unfair advantages they have and continue to enjoy as the result of chattel slavery, jim crow, the prison industrial complex and institutional racism. Thus, the Ali analysis maintains its’ truth. Then there was the argument I heard as a preteen, made by African American adult educators, politicians and religious leaders, coopted by the system. “You can change the system from the inside.” But, if you are inside, I would insist, you are a part of the system and therefore a part of the problem. From General Colin Powell, to Secretary of State Condoleezza Rice to President Barack Obama, no systemic change has ensued as a result of their being inside the system. At the highest and most influential levels of government #tokenblacks remain useless to the cause of liberating all Blacks, especially the poorest among us, from America’s vicious, direct, and unhindered physical, social, economic and psychological attack. The unicorn is said to be beautiful, rare, elegant, strong, pure, powerful, royal, good, fierce, noble, meek, gentle and unreal! In this regard I see the #tokenblacks. For I have and do observe that the #tokenblacks are victims of self-deception, believing themselves to possess the attributes of the mythical unicorn, disregarding the fact that it does not exist. Likewise, the #tokenblack is no token at all. The #tokenblack represents dollars in the US corporate strategy. Subsidies in the way of federal and state tax credits among other monetary benefits are attendant to the presence of blacks as line and management employees. The Work Opportunity Tax Credit alone for hiring #tokenblacks can run from $1,200 to $9,600 annually in this one program alone. Bear in mind the number of programs currently in place and those being created outnumber the #tokenblacks in most if not all companies that use them. Ironic is that these tax benefits widens the pay gap between the #tokenblacks and their white counterparts. But, then the #tokenblacks don’t seem to be psychologically impacted in a negative way because they “earn” more than most blacks, live larger than most blacks and often live in neighbors devoid of most blacks. Consider Skip Gates that is Henry Louis Gates, Jr., Professor at Harvard University. That’s Ivy League y’all. Big deal. Skip moved to Cambridge, Massachusetts around 1991 when he began teaching at Harvard. And, in 2009 was arrested for “breaking in” to his own home. Needless to say it was in a predominantly white neighborhood. What is with #tokenblacks? You will often find them in white neighborhoods. They’re rationales run the gamut, but at the end of the day it’s to get away from being hurt by, helping or engaging their own people, e.g., themselves. #tokenblacks hate themselves and obviously black folks in general. They are the ultimate result of brainwashed, conditioned, socially engineered “examples” of what assimilated blacks look like and should aspire to. When #tokenblacks wake up and bring their talents to bear in the upliftment of their people and their peoples communities, denying white America of their skills as well as monetary benefits attendant to their presence in white corporations the Black community will then compete with its true competitor; the whites. For #tokenblacks to market blacks to white businesses is tantamount to black plantation overseers offering up the men women and children of his heritage to the white man for favors only he and his immediate may enjoy. And, apparently to some degree, “…consider[ing] [him] self lucky…” Yes, I agree. He’s as lucky as a unicorn.